Motorola Smart Touchless Forehead Thermomet..
Tommee Tippee Closer to Nature Digital Ear ..
Dreambaby Large Display Flexi Tip Thermomet..
Tommee Tippee Closer to Nature DECT Baby Mo..
Tommee Tippee Closer to Nature Video Baby M..
Dreambaby Deluxe 10 Sec Fever Glow Thermome..
Tommee Tippee Closer to Nature Bath & R..
Motorola MBP667CONNECT 2.8" Video Baby Moni..
Motorola MBP36XL 5" Portable Video Bab..
Motorola MBP855CONNECT 5 inch Portable Vide..
Philips Avent Digital Bath & Room Therm.. The world of parenting is just a little more easier and reassuring with the AC1320. It combines a quality baby video and sound monitor. Ideal for a newborn infant and young baby who is starting to reach and explore. The 3.5” LCD screen on the Parent Unit clearly displays a number of monitoring features, so even if the sound is off you’ll know what is going on. 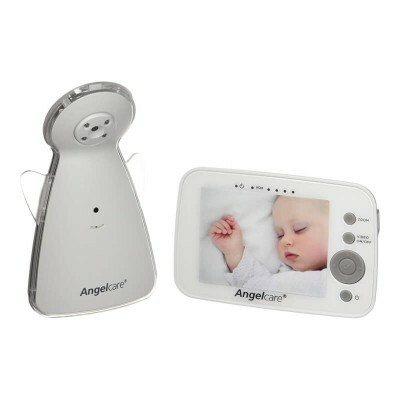 You can check on your baby during the night without disruption as the Photo Sensor on the Nursery Unit shows automatically a clear picture of your baby in the dark. Up to 820 feet (open field). Adjust the Parent Unit's screen to the desired level of brightness. A gentle little glow to guide you when you walk into baby’s room. The low-battery indicator on the screen of the monitor lets you know when it's time to change the batteries. Position your baby video monitor for the perfect view – and safely out your child’s reach. Moms and dads love this feature, especially since it helps create a safe sleep environment as their child reaches new milestones and becomes more curious. The Parent Unit may be small but you’ll be able to find it quickly with the push of a button. The battery option makes this system ideal for travel. Then, when you are at home, you can use the AC adapter to save your batteries for when you need them.